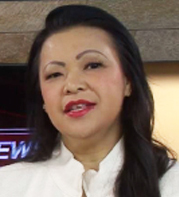 Asian News « V ASIAN TV – Vegas Asian TV – The Community Channel for Asian-Americans in Las Vegas. Introduced by VASIANTV in 2010 to the local viewers of the now defunct Vegas TV, ASIAN NEWS is back due to public demand and supported by a bigger and more active local Asian Community. The Asian Culture Alliance, a 3-year old umbrella non-profit organization that houses the Chinese American Group and the American Artists Association, has teamed-up with VASIANTV and THE MANILA EXPRESS NEWSPAPER to deliver the greatest things happening in and around the Las Vegas Asian Community. Newcomer Diana Fung will be the host-anchor for ASIAN NEWS. She will be joined by Veteran TV personalities Shannon Yang (R) and Melody Mojica (C). Shannon will be reporting from Beijing, China and will provide some Chinese-American recipes, while Melody provides ASIATOWN updates on new restaurants, red carpet and special events in Las Vegas.